Virtuoz is a free virtual desktop software which provides up to 20 virtual desktops. This feature makes it way better than many other similar software, like Tri-Desk-A-Top and Desktops, which comes with maximum 3 or 4 virtual desktops. Other than this great feature, it also supports hotkeys to quickly jump to a particular virtual desktop. 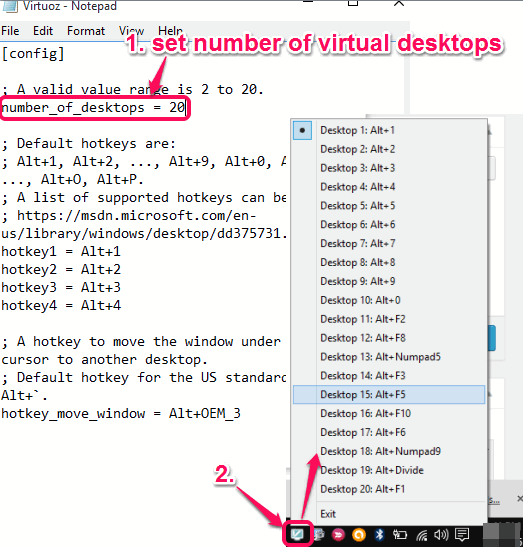 Moreover, it also supports hotkey to move any application to desired virtual desktop. By default, this software comes with only 4 virtual desktops, but you use its Configuration Settings file to set the number of virtual desktops and customize the hotkeys. The screenshot above shows its system tray icon and option to move any application to a particular virtual desktop. How To Use This Free Virtual Desktop Software? This free virtual desktop software comes as a portable application. You can use this link to download the zip file of this software. Extract that file in a folder and you will be able to access its application and Configuration Settings files. Execute its application file and it will start running in the system tray of your PC. You can right-click on its tray icon to access any virtual desktop (by default 4). Default hotkeys (Alt+1, Alt+2, Alt+3, and Alt+4) are also available to access any of the 4 virtual desktops. To add more virtual desktops, change hotkeys, and find the hotkey to move a particular application to a particular desktop, you need to open its Configuration Settings file. It can be opened easily in Windows Notepad. 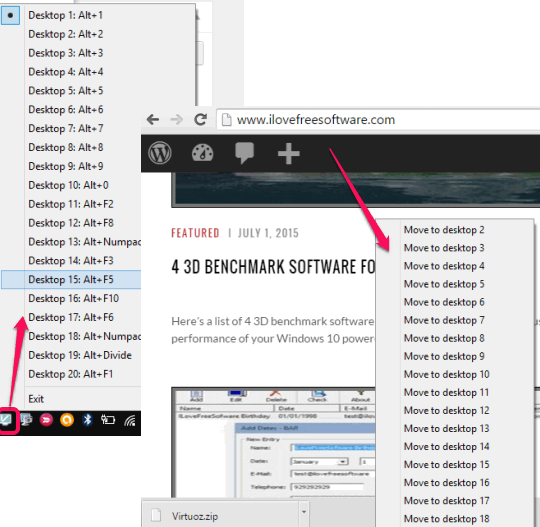 Now you can set the number of virtual desktops. The default hotkey to move an application to desired desktop is Alt+`. Save the settings and restart the application file of this software. After this, you can use up to 20 virtual desktops to increase your productivity. 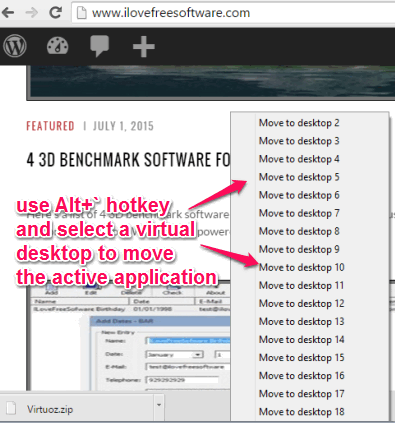 When you have to move a particular application to desired virtual desktop, open that application and use Alt+` hotkey. After this, it will show you options to move that application to required virtual desktop. Use mouse cursor and your application will move to the selected virtual desktop. Virtuoz is really an interesting and great virtual desktop software. You have full right to set the total number of virtual desktops, change the hotkeys, and move any application to a suitable virtual desktop. I can definitely recommend this software to you guys.